How do we avoid just repeating the question word for word? (divide and conquer! Separate out the ideas. Use synonyms). Think of your introduction as a road map. You have been given a destination (the question) and there are lots of perfectly acceptable ways of getting there. In your introduction you lay out clearly what directions you’ll take in your essay. MAKE SURE TO USE THE WORDS FROM THE Q – but don’t begin by simply parroting back the question word for word. There is nothing worse than “I agree 100% that…..”. Re-phrase the question in your own words to prove that you have understood it. 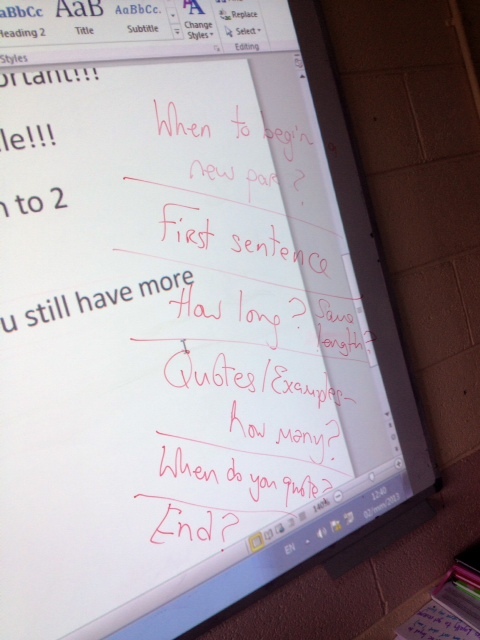 Divide the question into manageable chunks and discuss each part of the Q. List the things your essay will discuss to answer the question asked. Iago certainly feels superior to many of the people in his life. In the opening scene he criticises Othello & Cassio and he delights in creating pain and suffering for Brabantio. He does not respect other human beings, nor does he have a high opinion of anyone but himself. He takes the most negative possible interpretation of human behaviour in every situation, accusing Othello of being a lustful gold-digger; accusing Cassio of being a naïve ladies-man with little battlefield experience; accusing Dedemona of being fickle and motivated only by lust; and finally, confiding to both Roderigo and to us the audience his general outlook on human beings, which is that they are selfish and self-serving. How many quotes and examples should you include? (Hard to answer this one. Depends on the point you’re making. At least 3 quotes, no more than 7? Quotes can be two or three words – e.g. “honest Iago” or half a speech! Don’t include really long quotes – it’s irritating and unnecessary). His bitterness at not getting promoted to lieutenant leads him to believe that Othello was “loving his own pride and purposes” when he gave the job to Cassio. Iago sees his decision as a personal slight and an insult, because Iago has a very high opinion of himself “I know my price, I am worth no less a place”. His bitterness leads him on a quest for revenge and he begins to see people as simply pawns in a game of chess; each one will either help or hinder him in his quest. For example, rather than search for a new job, Iago decides to do everything in his power to destroy Othello. He takes a very negative interpretation of Othello’s decision to marry Desdemona, telling Cassio that Othello was motivated purely by her money and is satisfied now because he has “boarded a land-carrick” or treasure ship and is now guaranteed wealth (through his wife’s fortune) for the rest of his life. Iago is also very quick to believe the rumour that Othello has slept with his wife. He comments that “it is thought abroad that twixt my sheets he has done my office” and refuses to even bother checking if this rumour is true or not. This is hardly surprising given how certain he was that Othello was motivated by lust rather than love (“even now, now, very now, an old black ram is tupping your white ewe”) – it’s as if Iago refuses to even consider the idea that human beings might be motivated by a noble emotion like love rather than by their base animalistic desires. Iago allows for the fact that human beings might be essentially ‘good’ when he describes Othello as being “of a free and open nature that thinks men honest that but seem to be so” but he sees this as naïve and stupid. Finish your paragraph (or if the same basic idea stretches to two paragraphs, finish the second paragraph) by stating clearly how what you’ve just discussed is relevant to the question asked. Thus, it is clear that Iago thinks very little of Othello, seeing him as motivated by lust and greed and interpreting his trusting nature as a weakness rather than a virtue. (this is the final sentence of this paragraph/section on Iago’s interpretation of Othello’s behaviour). I used the analogy of a paragraph being a bit like a sandwich. The top slice of bread is the topic sentence. The meat in the middle is basically the quotes and examples you use to develop your discussion and prove your point. The final sentence is like the bottom slice of bread in the sandwich – it holds everything together, connecting the meat (the quotes & examples) back to the top slice (the question asked). 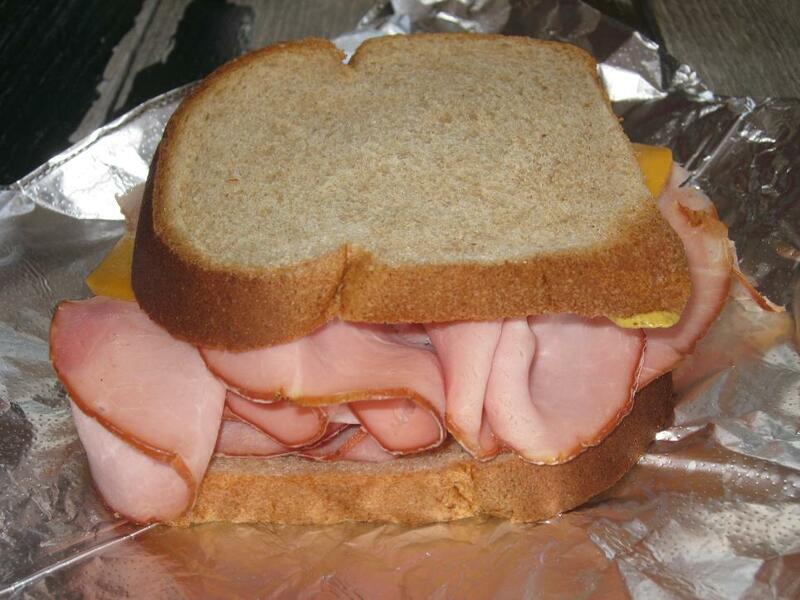 Without the meat the sandwich wouldn’t be a sandwich but without one of the two slices of bread it would also not be a sandwich! You need both slices of bread and lots of filling. If you have lots to say for one idea and it stretches into two paragraphs, this is basically a double-decker sandwich. It’s fine but too many double-deckers in one essay might mean you run out of space (or time!) so don’t fill up that essay too much with double-deckers!!! par 5 could discuss his plan for revenge. There is not ONE PERFECT WAY to structure any essay – the important thing is that each paragraph has a clear focus and that each paragraph clearly responds to the question. If you just tell the story, you will NOT do well. NOTE: This example only deals with Act 1 because this is an essay we did when we finished that act. Obviously in the exam you’d be expected to draw from the events of the entire play, not just Act 1. Think I’ll borrow this for tomorrow’s class if that’s ok, it’s fantastic! No prob at all. One thing I did was ask them first “what do you find confusing about writing introductions?”. As they told me, I wrote the list on the board. Then I ticked off each one as we discussed it. This is actually a document we created in real time in class – not all of it (cause we ran out of time) but def the first bit about introductions and the bit where I explain that a paragraph is a bit like a sandwich (they found that really helpful as a memorable analogy). Best of luck with it – I def recommend that rather than just hand it out and read it, you first get them to articulate what it is they find confusing about writing introductions and what it is about the structure of a paragraph they don’t “get”, list them on the board and them cross them off as the ‘answers’ to these ‘confusions’ make things clearer. Hi Evelyn, Congratulations on winning Best Educational Blog. Well done and well deserved!. Am looking through some ideas for Othello as I am revising it with LCs now. Am finding this very helpful thanks!! How long should one of these essays be? About 4-5 pages. Check out http://leavingcertenglish.net/2011/05/how-much-to-write/ for rough guidelines on how much to write for each section. should we write our points in chronological order? Not necessarily. In general terms yes, you want to deal with events at the beginning, in the middle and at the end more or less in order. However, the single greatest error I see in student essays is an inability to leave things out – a reluctance to select ONLY that which is relevant to answering the question asked. You see this is essays where the student has written 2 pages and is still stuck in Act 1! In fact, many students write an entire essay and never get past Act 2… or they cram all of Act 3, 4 and 5 into one paragraph and don’t have time to write a proper conclusion. On the other hand it is possible to write an essay where each paragraph is built around a central idea, and is not necessarily chronological. For example, imagine the question was “Shakespeare’s Othello is a compelling drama whose appeal is as strong now as the day it was written” – discuss. Each paragraph has an identity; is built around a central idea and so the essay will include some ‘jumps’ and won’t be strictly chronological. For me personally, I’ve always tried to combine the two – chronology and ideas. I give each paragraph an identity in my plan. When I get to the end of that paragraph, my next paragraph moves on and develops a new idea. This stops me from getting stuck in Act 1 for two pages. It stops me from simply ‘telling the story’ of the play. It gives my essay shape and structure and ensures that by the end of my essay I’ve made it to the end of the play in my discussion. Hi Evelyn, I was just wondering what advice you would give a repeat student who has only taken up Othello this year? Getting kinda scared now about Othello! I’m a bit out of the loop on Othello myself as I’m not in the classroom this year. Know the plot. Know the central characters. Know the major themes. Know quotes. Have you seen a production of the play? That always helps. A film version is an ok substitute but it’s not the same as seeing a dramatic performance. Form opinions. This is where you really get to know a play, its themes and characters. Stay calm. If for no other reason, think about what happened to poor Othello when he lost the rag! Hi sorry to bother you but could you please help me with some sentence starters. I’ve not done an essay or English lit before and I’m finding it hard to actually start writing. Would be really helpful. Thank you.